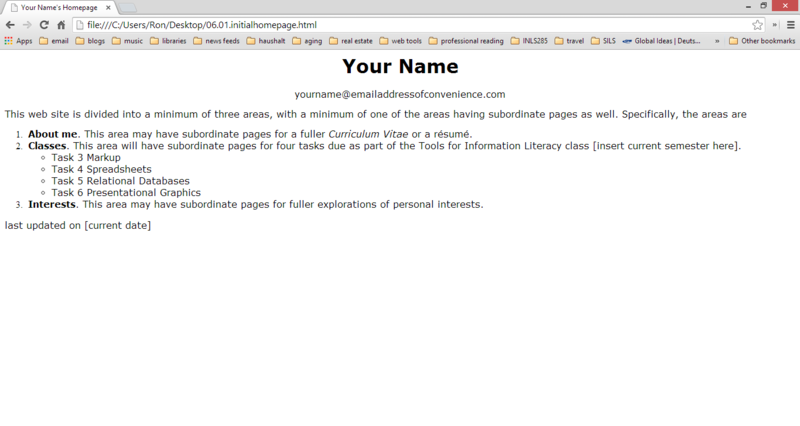 We'll start our consideration of HTML by creating a web page using MSWord. If you have never made a web page, we are about to see how simple it can be. Open this document. It should open in its base application, MSWord. You have a basic page with some basic formatting on it. Save it to a space on the computer you are using, a place you can find. I suggest you create a working folder and name it something you can easily find and then save the document into that folder. After you do this, you should be in your new folder and all future saves will be saved here. In the dialog box that appears, chose Save as type: web page ("htm;*html), and then select the Save button. You've done it. You now have a web page. Your MSWord display will change, but you are still in MSWord and you can manipulate this web page as if it were either a web page or a paper document. However, we first want to see how it looks in a browser. It looks like this because your operating system is performing both server and client functions for you. But the world cannot yet see it. You will have to FTP it to a WWW-capable server (like Isis) to make it available to the world. For right now, you can use your browser to see what it will look like when you do decide to go public. Now, put it aside and let's discuss the theory behind what we just did.